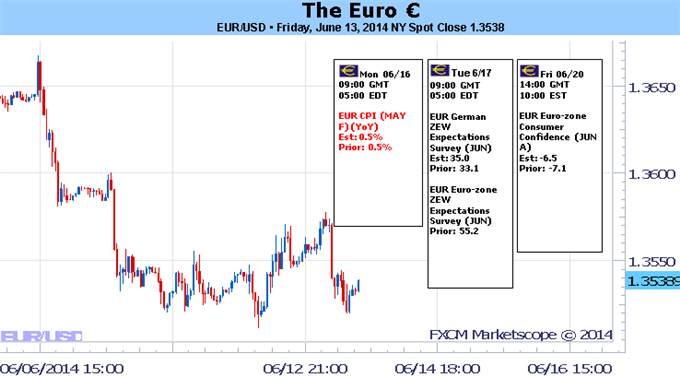 The dollar and the euro were on the back foot in the past week. The focus is now on the Fed decision and the UK inflation data. In addition, the Philly Fed Manufacturing Index and inflation figures will be of interest. Here are the main events on our FX calendar. Here is an outlook on the market-movers for the coming week. A jump in US job openings underpinned the US dollar. While this figure is lagging, it closely watched by the Federal Reserve. However, other figures from the US, such as retail sales, were mediocre. The UK enjoyed encouraging employment figures that lift the prospects of an early rate hike, and Carney indeed explicitly said that a rate hike make come sooner than later, sending the pound jumping up.. In Europe, the lower bond yields and the implementation of the negative deposit rate weighed on the common currency. Another currency that stood out is the kiwi that leaped up: the RBNZ hiked the rate and did not signal a pause. UK inflation data: Tuesday, 8:30. Annual inflation in the UK edged up to 1.8% in April, rising for the first time in almost a year, following 1.6% in the previous month. The main cause for this rise was higher travel and energy prices. Analysts expected a smaller climb of 0.1%. However rising inflation ignites new fears that the standard of living will decline due to falling wages. CPI is expected to slide to an annual level of 1.7%. The RPI is predicted to remain at 2.5% and Core CPI to slide to 1.7%. German ZEW Economic Sentiment: Tuesday, 9:00. German economic sentiment plunged in May by 10.1 points, to 33.1, hitting the lowest level since January 2013. The Ukraine crisis was the probable cause for this fall starting effect economic activity, especially in the eastern part of the country. Economists expected a 2.2 points fall to 41.3 in May. A rise to 35.2 points is expected now. The all-European figure is also expected to advance to 59.6 points. US Building Permits: Tuesday, 12:30. U.S. building permits soared in April to their highest level in nearly six years, reaching 1.08 million-unit pace. The sharp rise offered hope that the recent sluggishness in the housing market may be over. The 90,000 rise surprised analysts expecting a 1.01 million-unit pace. A similar level of 1.07 million is estimated now. Housing starts carry expectations of dropping from 1.07 to 1.04 million. US inflation data: Tuesday, 12:30. U.S. Consumer Price Index increased 0.3% in April after posting a 0.2% gain in March, as food prices edged up for a fourth consecutive month and the cost of gasoline climbed. The reading was consistent with analysts’ forecast. In the 12 months through April, CPI gained 2.0% after a 1.5% rise in March, the biggest increase since July last year. Meanwhile, core inflation, excluding food and energy prices, rose 0.2% above predictions of a 0.1% rise and following a 0.2% rate in the previous month. US inflation remains in Goldilocks territory. Both CPI and Core CPI are expected to rise 0.2% m/m. UK MPC Meeting Minutes: Wednesday, 8:30. After Carney lifted the pound with his rate hike comment, it will be very interesting to see if one or more members already voted for a rate hike in June’s no-change decision. Up to now, Carney enjoyed unanimous support behind his policy, and that is what is expected now. A non-unanimous vote could push the pound even higher. US rate decision: Wednesday, 18:00, press conference at 18:30. The Fed is expected to taper bond buys for the 5th time, to $35 billion / month. Recent data from the US has been positive and showed growth in jobs as well as in other sectors after the terrible first quarter. Markets will likely focus on the fresh economic projections, especially those concerning the potential date of a rate hike. The previous decision was not accompanied by a press conference, and it passed quite quietly. This was not the case in March, when Yellen said that a rate hike could come within 6 months of the end of QE and stirred markets. 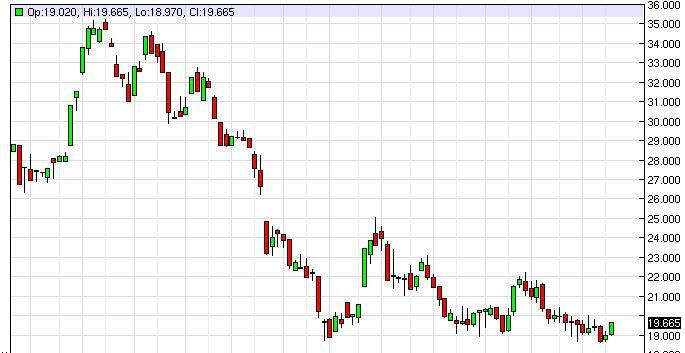 Was it a slip in her first appearance or did she sow the initial seed for a rate hike in early 2015? Every word she says now will be scrutinized and could cause a significant market stir. Given the recent improvement, we can expect a more hawkish approach. If the hints are subtle, a full response to the FOMC statement and the press conference can only be expected in the following sessions. Contrary to April’s decision, this one could have a long lasting impact on markets. NZ GDP: Wednesday, 22:45. Economic growth in New Zealand continued to grow in the last quarter of 2013, rising 0.9% from a 1.2% expansion in the third quarter. Analysts expected a higher rise of 1.0% in the 4th quarter. Manufacturing and wholesale trade were the main contributors to the rise in output. On an annualized rate, GDP expanded 3.1% in the December quarter, in line with forecasts. A growth rate of 1.2% is expected now. Switzerland rate decision: Thursday, 7:30. The Swiss National Bank kept rates unchanged at 0.25% but was more optimistic on future growth prospects. The bank reiterated its commitment to defend the 1.20 per euro limit with unlimited interventions and stood ready to take further measures if necessary. The SNB said economic activity in Switzerland should improve from the first quarter of 2014 confirming a 2.0% growth this year. US Unemployment Claims: Thursday, 12:30. Recent trends in jobless claims have been positive, with a gradual convergence towards the 300K level. While the drops have never been steady, the US job market seems to be going in the right direction. A figure of under 300K will certainly be dollar positive, but after the recent rise to 317K, a similar value of 316K is predicted. US Philly Fed Manufacturing Index: Thursday, 14:00. US manufacturing barometer in the Philadelphia area declined less than expected in April, reaching 15.4 after rising to 16.6 points in March. The Philly Fed’s general conditions index reaching 15.4 in May was nearly as strong as April’s 16.6. This report, together with Empire State, reaffirms the strength of the US manufacturing sector. A small slide to 14.3 points is on the cards. 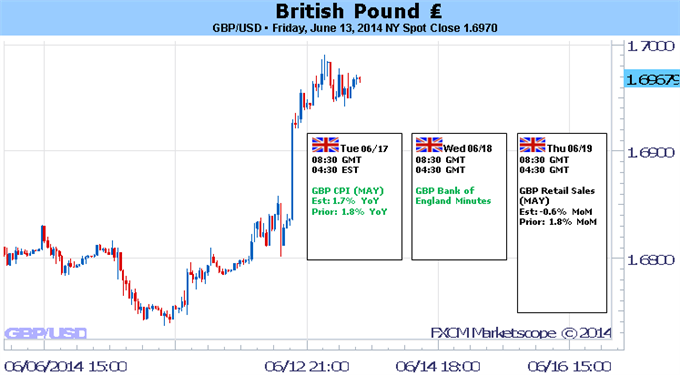 The GBP/USD rallied to a fresh monthly high of 1.6990 as Bank of England (BoE) Governor Mark Carney showed a greater willingness to normalize monetary sooner rather than later, and the pound-dollar may continue to carve a series of higher-highs & higher-lows during the summer months amid the ongoing shift in the policy outlook. Nevertheless, the data prints due out next week may generate a minor setback in the British Pound rally as the U.K. Consumer Price Index (CPI) is expected to narrow to an annualized 1.7% in May, but the BoE policy statement may heighten the bullish sentiment surrounding the sterling should the central bank adopt a more hawkish tone for monetary policy. Indeed, the BoE Minutes may reveal a growing dissent within the Monetary Policy Committee (MPC) as a greater number of central bank officials turn increasingly upbeat on the U.K. economy, and the policy statement may spur a more meaningful pickup in interest rate expectations should the committee lay out a more detailed exit strategy. With that said, a split BoE decision may serve as the fundamental catalyst to trigger another near-term rally in the GBP/USD, and we will maintain a bullish outlook for the pair as the Federal Reserve remains reluctant to move away from its zero-interest rate policy (ZIRP). As a result, the GBP/USD looks poised for a higher-high as it carves higher-lows in June, and we will look for opportunities to ‘buy dips’ in the pound-dollar as the Relative Strength Index (RSI) breaks out of the bearish momentum carried over from the previous month. The Australian Dollar managed a strong showing last week, rising to a two-month high just below the 0.95 figure against its US counterpart. The advance tracked an improvement in monetary policy expectations, with a Credit Suisse gauge tracking the priced-in 12 month outlook rising to the highest level since mid-May. High-profile event risk on the domestic and the external fronts in the week ahead threatens to undermine the rally however. The spotlight initially falls on minutes from June’s RBA policy meeting. The policy announcement struck a familiar tone, arguing for a period of stability in interest rates. With that in mind, traders will look to the text of the minutes for added color, attempting to gauge how long the standstill is likely to last and the direction that policy is likely to take thereafter. 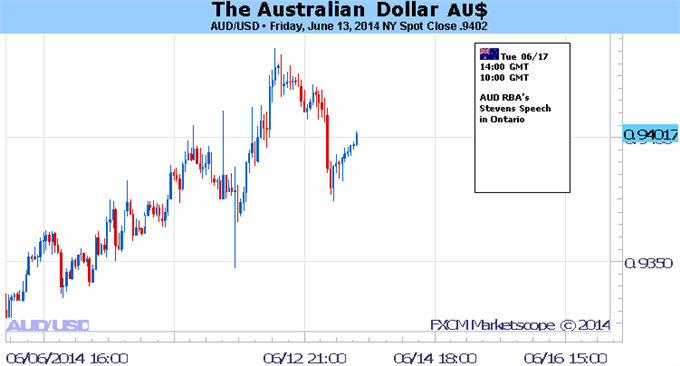 Minutes from a likewise status-quo flat rate decision in May proved telling, revealing a dovish lean in the Bank’s posture and sending the Aussie lower. Australian economic data dramatically deteriorated relative to expectations between the May and June meetings (according to data from Citigroup), warning that a similar dynamic may play out again. Later in the week, the focus returns to the Federal Reserve the rate-setting FOMC committee convenes for its policy meeting. This outing takes on particular significance in that it will be accompanied by the release of an updated set of policymakers’ economic forecasts as well as a press conference from Fed Chair Janet Yellen. As we’ve discussed previously, the fate of the Fed’s effort to “taper” QE asset purchases with an eye to end the program this year – paving the way for interest rate hikes – has been a formative catalyst for the markets this year. US economic news-flow has broadly improved relative to consensus forecasts since early April but a string of disappointing releases over the past three weeks have rekindled doubts about the strength of the recovery from a dismal performance in the first quarter. Indeed, the US Dollar has come under renewed selling pressure as traders scaled back bets on swift Fed policy normalization, putting the greenback’s multi-year uptrend in jeopardy. For their part, FOMC officials have adamantly maintained that the first quarter was a hiccup in an otherwise supportive environment. If that sentiment is reflected in an upgraded set of economic forecasts and/or an upbeat Yellen presser this dynamic may be overturned, undermining the Aussie’s perceived yield advantage and sending it lower anew. The Euro finished near four-month lows versus the Dollar, but the lack of volatility in recent markets makes it unlikely it breaks significantly lower. We’re watching key event risk for a potential breakdown. A relatively empty European economic calendar leaves focus on the upcoming US Federal Open Market Committee meeting, and any surprises from the Fed could force major USD pairs out of their recent trading ranges. It’s almost a given that the FOMC will taper their Quantitative Easing purchases by a further $10 billion through their decision. Thus instead of the actual decision traders will focus on official statements, changes in Fed inflation and growth forecasts, and the press conference to follow the announcement. Of particular interest is whether the Committee hints at the timing of future interest rate hikes. Interest rates are especially important for the Euro as traders have sent it to multi-month lows on the widely-expected European Central Bank rate cuts. The fact that the US Federal Reserve is headed in the opposite direction helps explain why the EURUSD trades near key lows. Yet clear uncertainty in Fed forecasts leaves ample room for disappointment and potential for Euro volatility. Any major FOMC surprises could ultimately force the Euro out of its recent range versus the Dollar. Yet FX options markets show volatility prices continue to trade near record-lows, and recent price action offers few clues on when volatility might return. Even a sharp two-day sell-off in the US S&P 500 and broader global equities wasn’t enough to drive the safe-haven US Dollar above key resistance versus the Euro. The lack of volatility and conviction thus keeps us focused on buying the Euro near support, selling near resistance. Our Senior Strategist warns that a close below $1.3520 could spark a larger decline, but until then watch for the Euro to remain in a tight range versus the Greenback. Gold prices are markedly higher on the week with the precious metal up 1.64% to trade at $1273 ahead of the New York close on Friday. The gains come amid losses in broader equity markets and continued weakness in the greenback with the Dow Jones dollar index making fresh monthly lows on Friday. Building geopolitical tensions in Iraq and Ukraine have offered some much needed support to gold prices which had fallen more than 10% off the March high. Heading into next week the Federal Open Market Committee Monetary Policy meeting will be central focus as the Fed releases its quarterly economic projections as they pertain to growth, interest rates and inflation. Despite expectations for another $10Billion taper, the updated economic projections may have the greatest impact on markets as participants continue to weigh the timing of the first Fed rate hike. Should the updated forecasts undermine market expectations for a mid-2015 rate hike, look for gold to remain well supported with a break above interim resistance targeting levels just below $1300. From a technical standpoint, gold looks poised to close the week above the $1270 threshold. For weeks now we have continued to target this region between $1260/70 as it's offered major pivots in price dating back to June of last year. Near-term resistance is eyed at the confluence of the 50% retracement from the May decline and the January High at $1277. A break back below $1260/70 shifts our focus back broader decline seen off the March highs with support targets seen lower at $1236 and $1214/16. With the monthly opening range yielding little in the way of technical clarity we will maintain a neutral stance heading into the FOMC rate decision on Thursday. The S&P 500 had a negative week over the last 5 sessions, but as you can see bounced a bit towards the end in order to show signs of support. This support of course was found out the 1920 level, an area that we said was important. With that, we feel that the market should more than likely bounce from here, and continue to go much higher. We still have a target of 2000 over the longer term, and therefore have no interest whatsoever in selling this market. 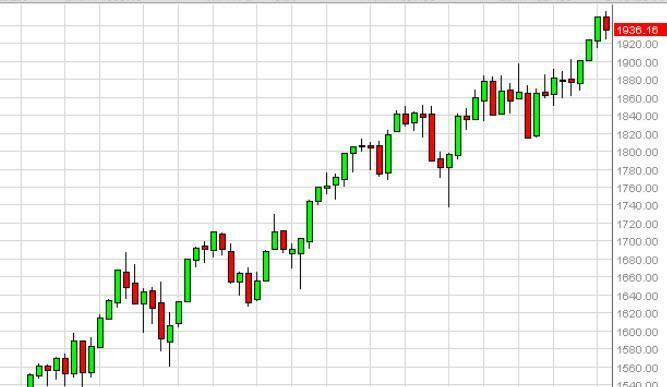 The Dow Jones Industrial Average fell during the course of the week, slamming into the 16,750 level. This is an area that on the shorter-term charts does show a significant amount of support, so the fact that we could not go below there isn’t exactly a surprise. With that being the case, we believe that a supportive candle should appear, and that should allow us to keep going long of this market. 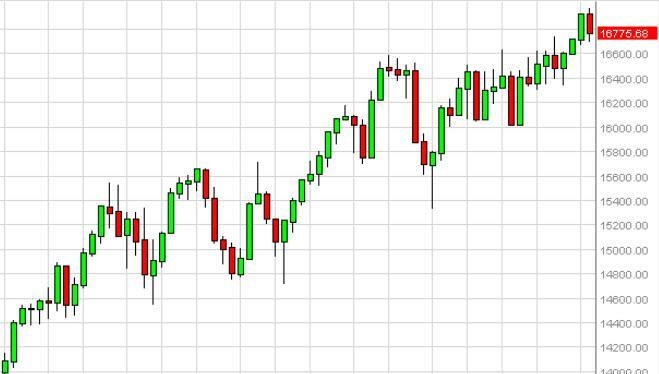 We believe ultimately that the Dow Jones will continue to offer value, and therefore continue to go higher. The US Dollar Index rose during the course of the week, but remained below the 81 handle, a vital resistance area to get above in order to continue going higher. That being the case, it appears that the market continues to consolidate, and it would take a break above the 81 handle in order for us to consider this market able to breakout. If it does though, we should head to the 84 handle eventually, and we would enter a longer-term bullish move. Until then though, we suspect that this market will be fairly tight for the longer term trader. The silver markets rose during the course of the week, and close the very strong. We are just above the $19.50 level however, and as a result we think that the market is starting to pick up steam. It does appear that we will more than likely clear the resistance, so we are buyers above the $20 level. 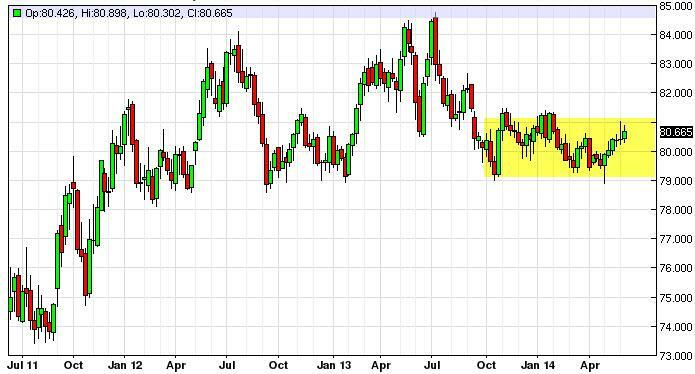 At that point time, we would expect the $22 level to be targeted next, and then perhaps $25 given enough time. The $19 level continues to be a significant amount of support, something that we anticipate going forward as well. 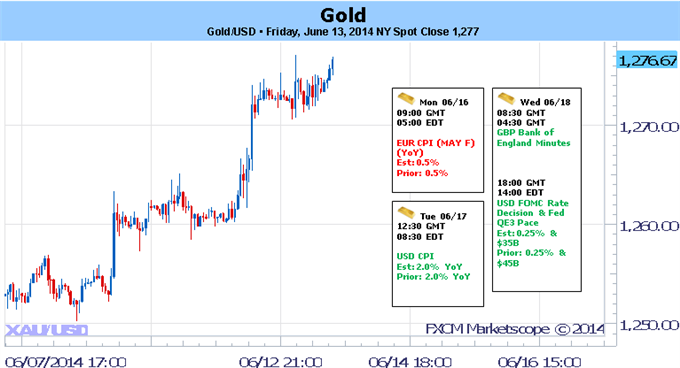 The gold markets rose during the course of the week, using the $1250 level as a support base. The market looks as if it’s ready to tackle the $1300 level, an area that should be somewhat resistive. If we can get above there, this market would more than likely find its way to the $1400 level over the course of time. Pullbacks from here and more than likely will find buyers all the way down to the $1200 level, so we do feel that this market has more bullish bias to it in the next few candles, but suspect that he will continue to be essentially sideways.